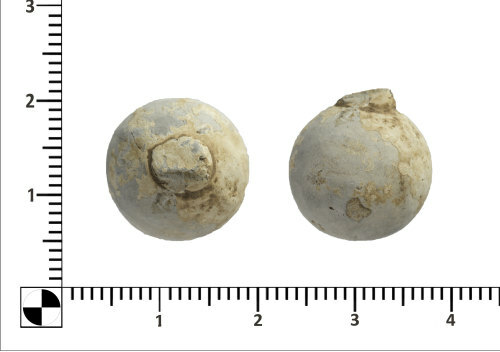 A cast lead alloy shot / ball for use in a Carbine of post medieval date (AD1600-1800). The shot is spherical with a relatively well formed surface patina. The shot is relatively round and smooth - suggesting that it has not been fired. There is a raised sprue scar with two facets where the casting sprue was probably cut with nippers. The colour of the ball is a pale grey / white. It shows some signs of damage, probably caused by agricultural machinery. A casing seam is visible, and there is no delamination on the surface of the shot. This ball / shot was one of over 100 mixed sized shot found on 2 acres of flat and slightly elevated ground, in a field that is around 15 acres.